I love to stumble across hole in the wall restaurants, that’s usually where you find the best food. I have two very favorites, one is a roadside joint outside of Austin, Texas that serves the best burgers on homemade sourdough rolls. The second is The Red Bar in Grayton Beach, Florida. For those of you who vacation here, your probably thinking that this is no hole in the wall because in the summer the wait is 2 hours or more for a table. But The Red Bar does a hole in wall right. A simple 5 item menu presented on a chalkboard, only cash is accepted and you feel like you’re in a psychedelic den from the 60′s. 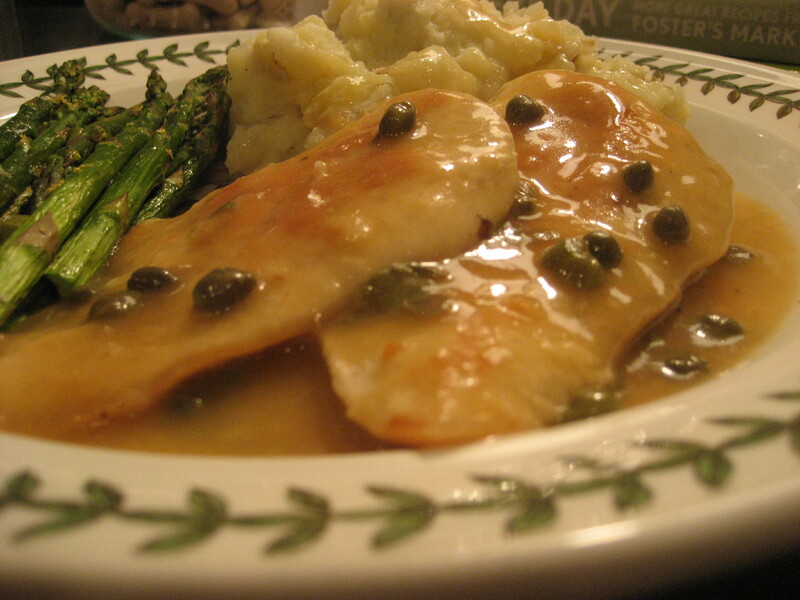 My favorite dish is the panned chicken, of course that means fried and covered with a buttery sauce – here’s my take with out the psychadelic den. In a large saute pan, heat olive oil over medium-high heat. 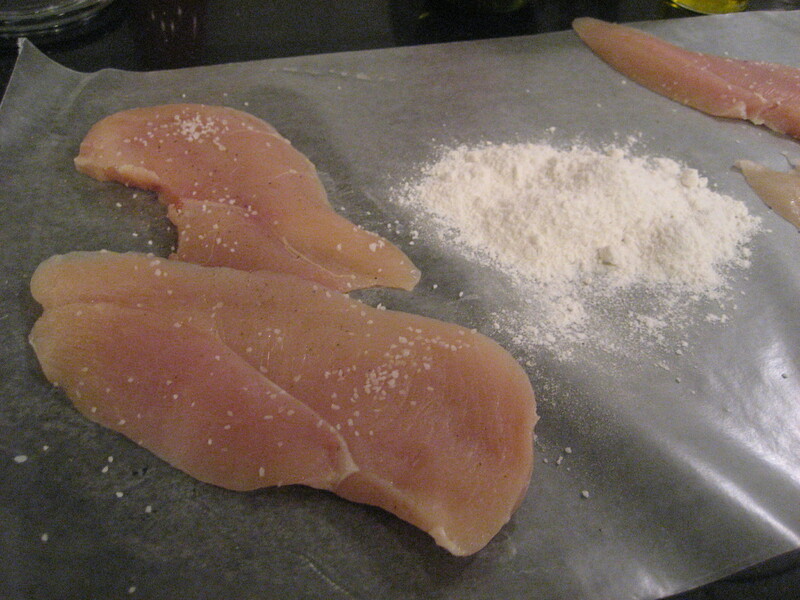 Season chicken with salt and pepper, then dredge lightly in flour. 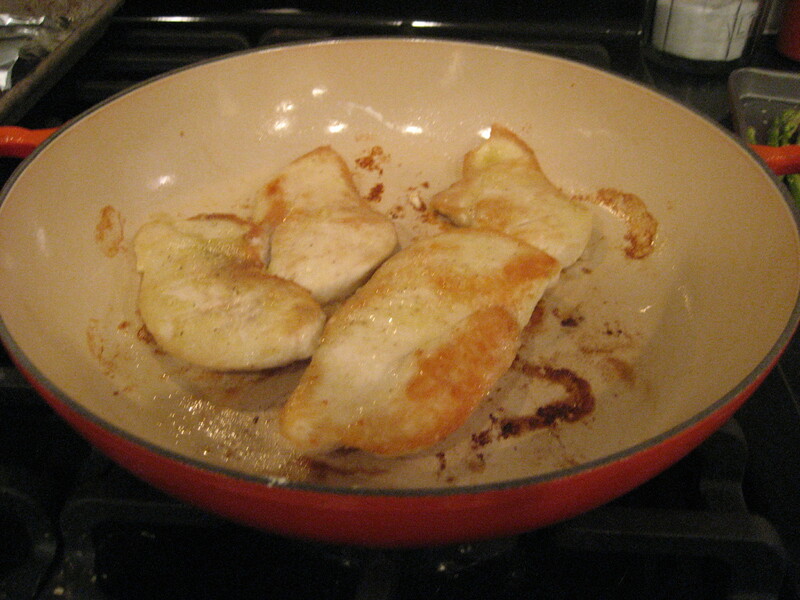 Place chicken in hot oil, cooking for 5 minutes on each side until golden brown. Remove chicken and set aside. Add 1 and 1/2 cups chicken broth to pan to deglaze, stirring up all the bits from the bottom. Let reduce for about 5 minutes. In the meantime, mix cornstarch and 1/4 chicken broth in a small bowl. Add to reduced chicken stock and stir until sauce is thickened. 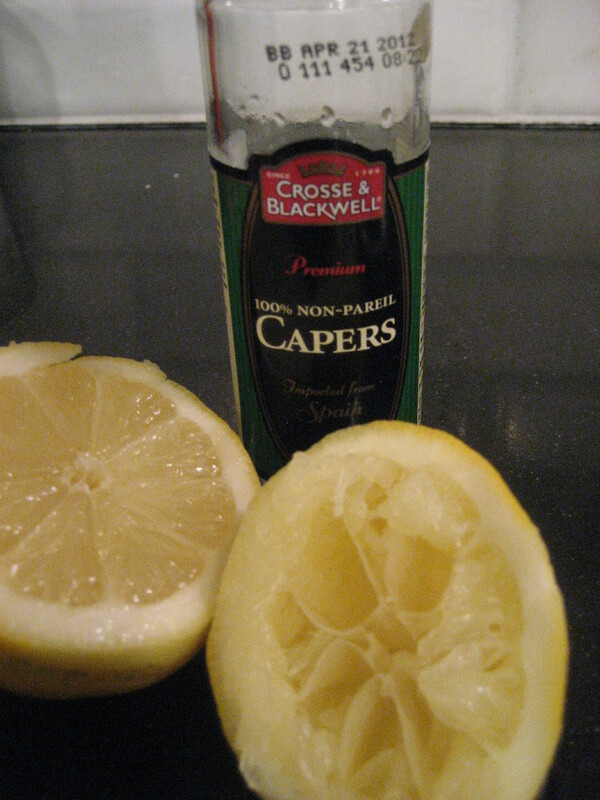 Add juice of one lemon, capers and stir of butter. Add chicken back to pan and let simmer in sauce for about 10 minutes, until chicken is cooked through. If you prefer the sauce to be thinner, just add a little more chicken broth. 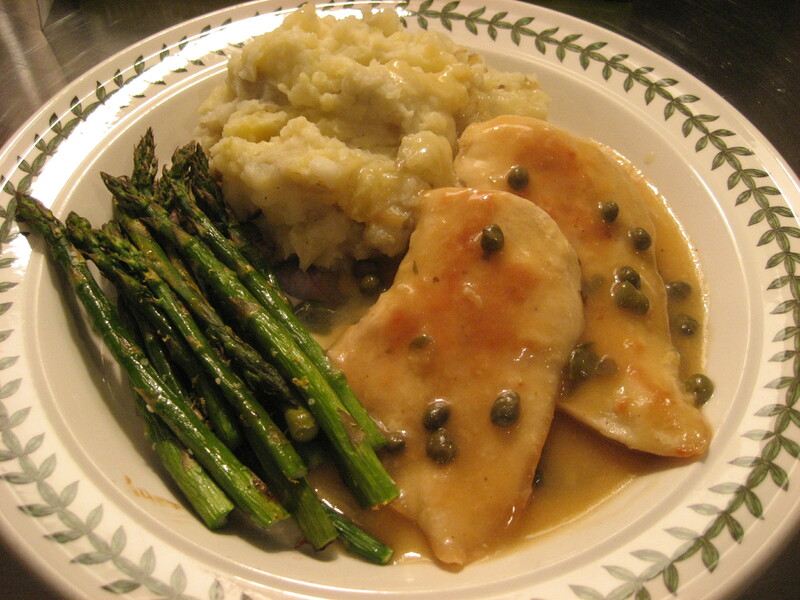 I usually serve this dish with roasted garlic mashed potatoes and oven-roasted asparagus but the chicken is also good over a whole grain pasta. 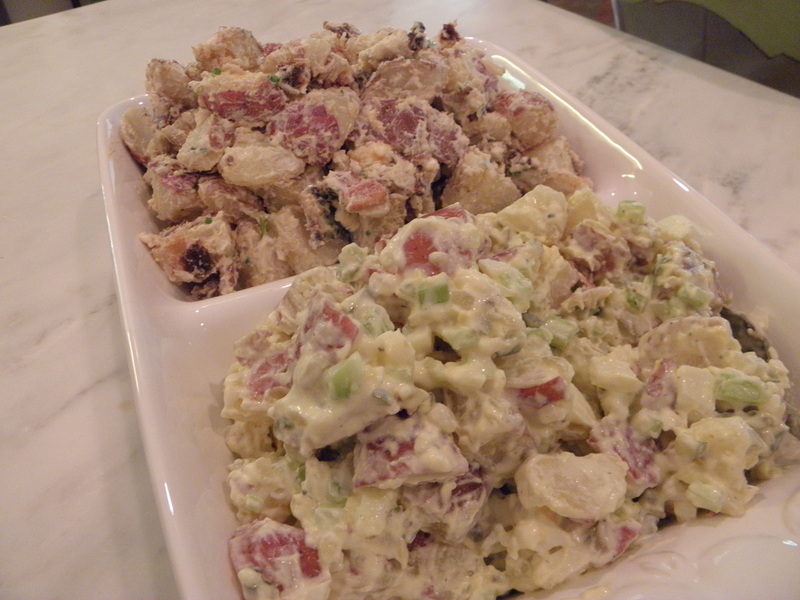 Stay tuned tomorrow and I fill you in on how to make the mashed potatoes and asparagus. 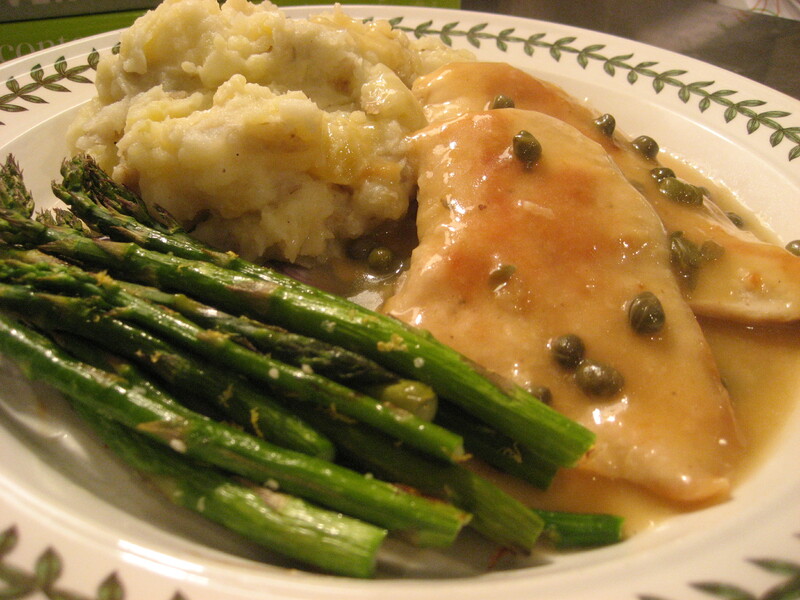 This entry was posted in Main Dish and tagged asparagus, butter, caper, chicken, chicken broth, cooking, cornstarch, Florida, Food, garlic, Grayton Beach, lemon, mashed, panned, pasta, potatoes, recipe, roasted, Sauté, The Red Bar on February 17, 2011 by lolleigh. So yesterday was another birthday. 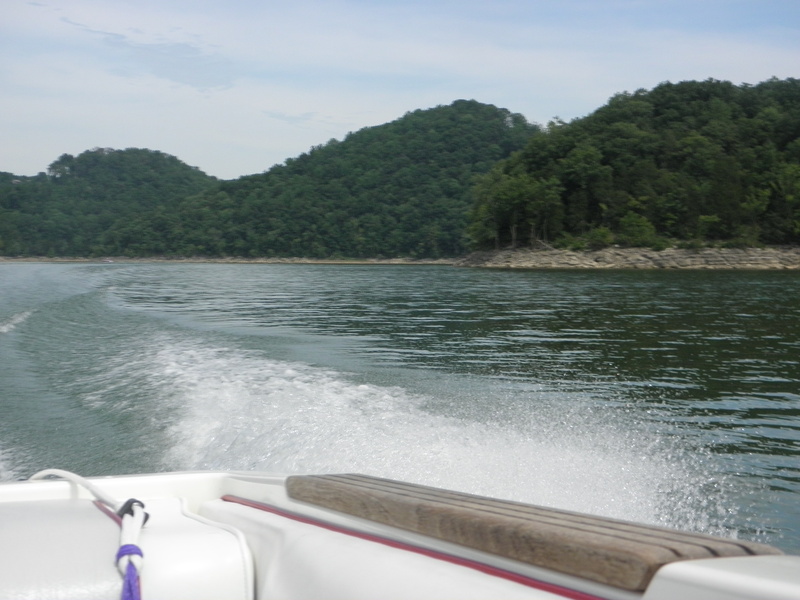 When you get to the point like I have and your birthday means being over the hump of mid-thirties and on your way to 40 celebrating is a lot less of a fuss. So I spent the day with my two boys (grown and not), went to lunch and did some shopping. As I oohed and aahed in Sur La Table, I thought what a difference this is from turning 21 when all you could wait to do is run to the nearest convenient store at midnight and buy beer – all I wanted at 36 was to indulge in a Le Creuset! 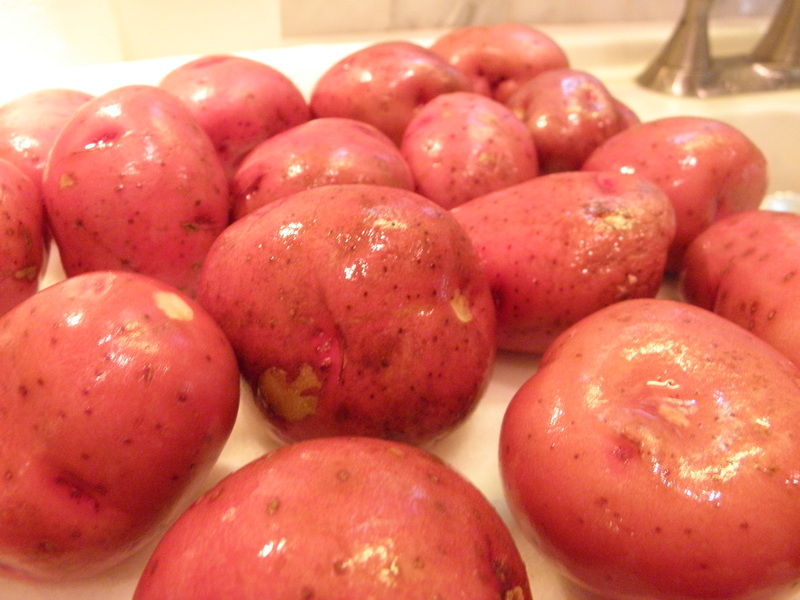 And then I thought potatoes – they’re a lot like birthdays. 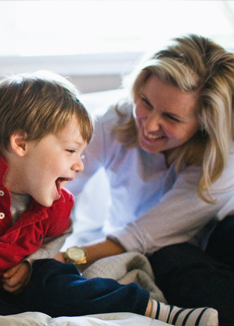 You can jazz them up or make them simple. Have a low fat version or go over the top and indulge…the possibilities are endless. So in the end I choose a lovely baking dish and came home on mission to create a low fat, easy and a little bit exciting birthday, oh I mean potatoes! 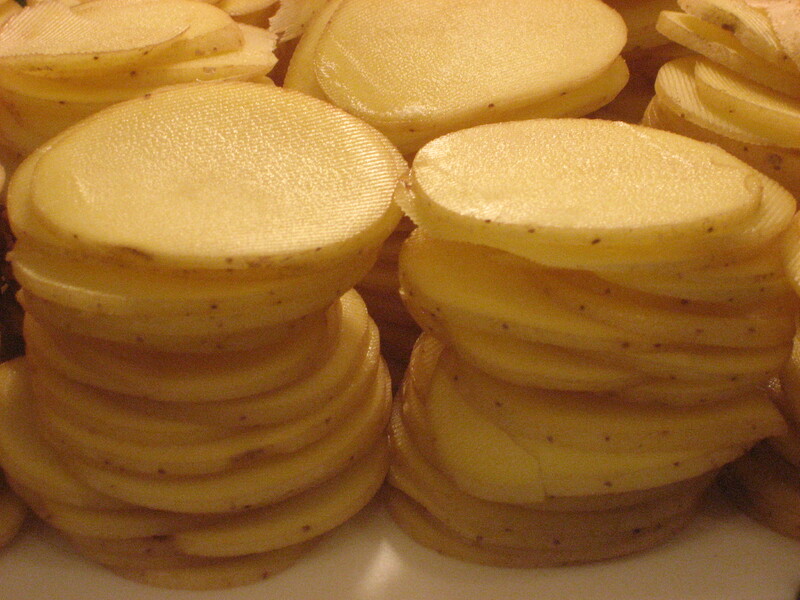 Wash and dry potatoes and then thinly slice, preferably with a mandoline. In a small saucepan, add evaporated milk, chicken stock and minced garlic then whisk in flour. Heat slowly over medium-low heat until it is just warm. Spray a baking dish with canola oil spray. 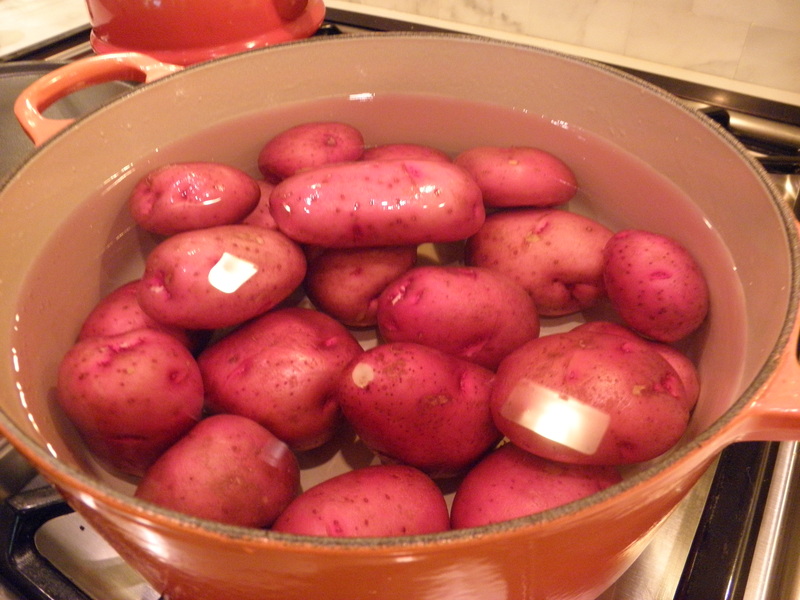 Take 1/3 of the potatoes and layer, overlapping in the bottom of the dish. 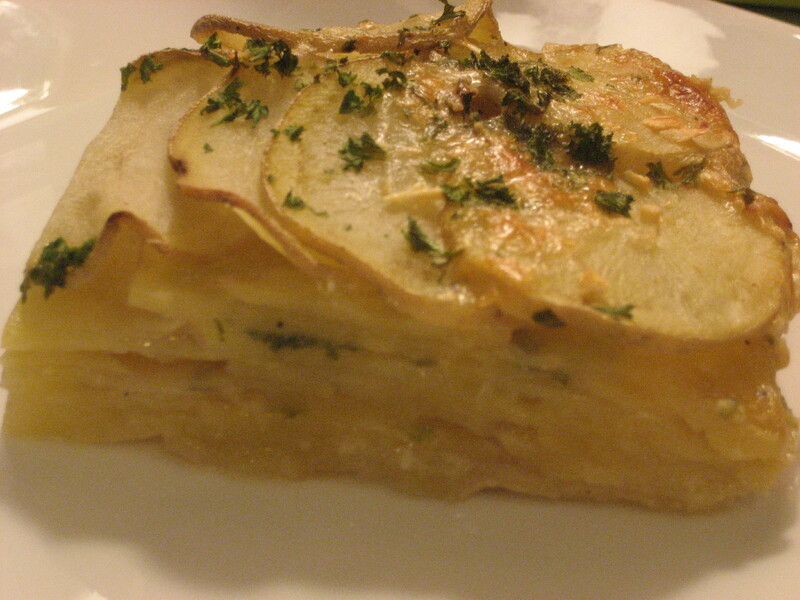 Season the potatoes generously with salt and pepper, then sprinkle 1 tbsp each of parmesan cheese and parsley. 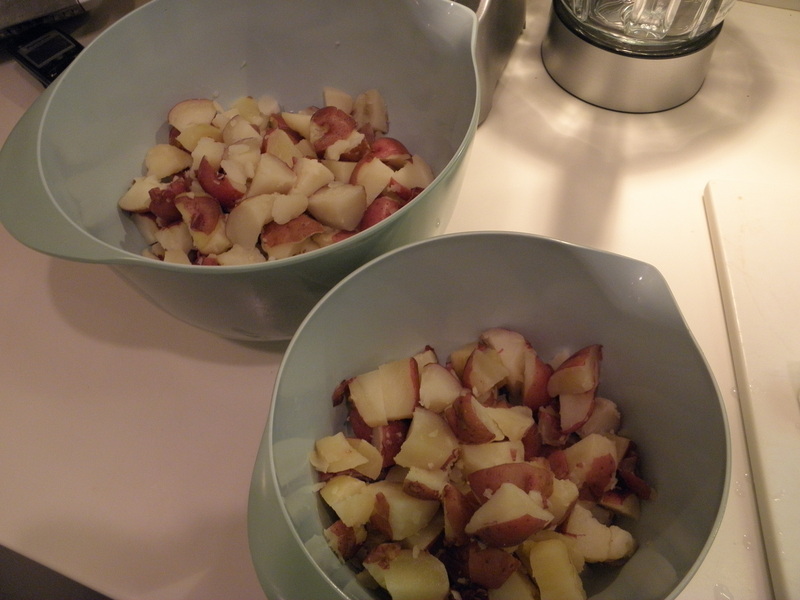 Pour 1/3 of the milk mixture over the potato layer and then repeat this process two more times. Cover baking dish with foil and bake for 35 minutes. Remove foil after 35 minutes and continue baking for 35 more minutes. Top should be golden brown. Remove from oven and let stand for 5 minutes before cutting. 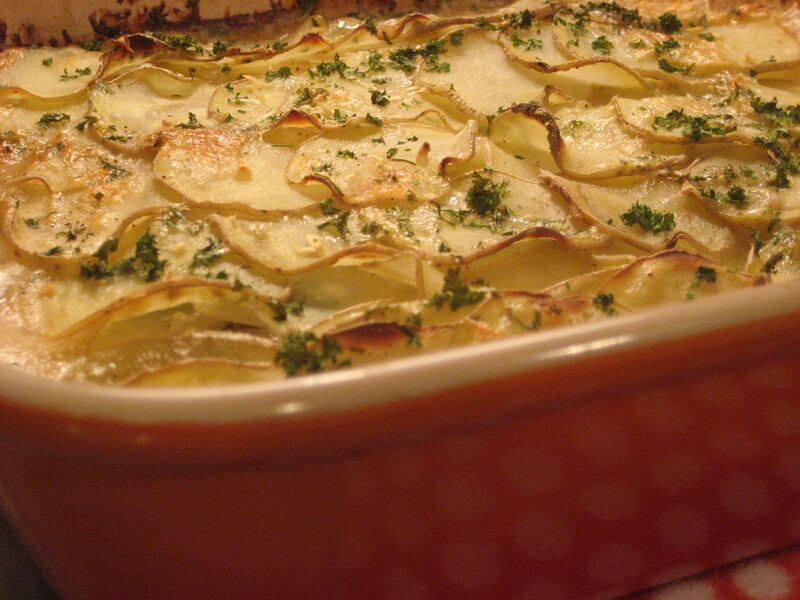 This is not your typical potato gratin. 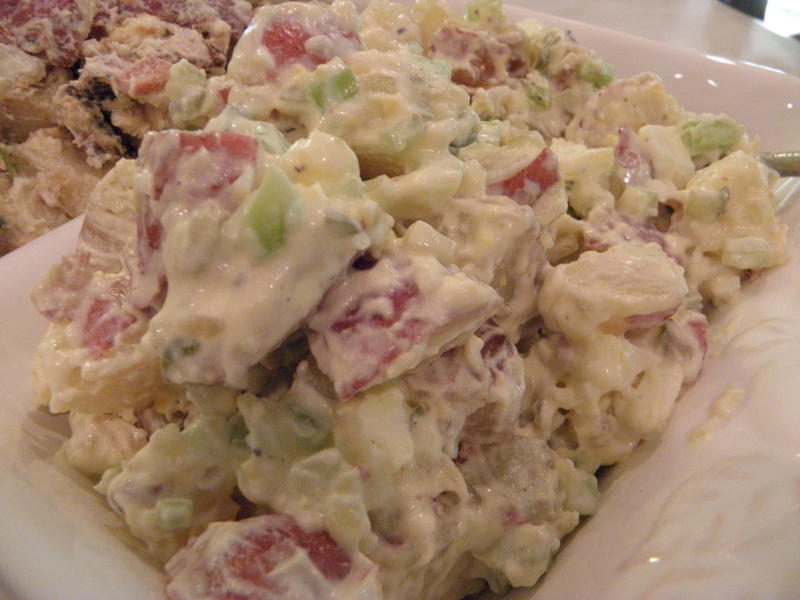 It is not bathed in cheese and butter like traditional recipes. 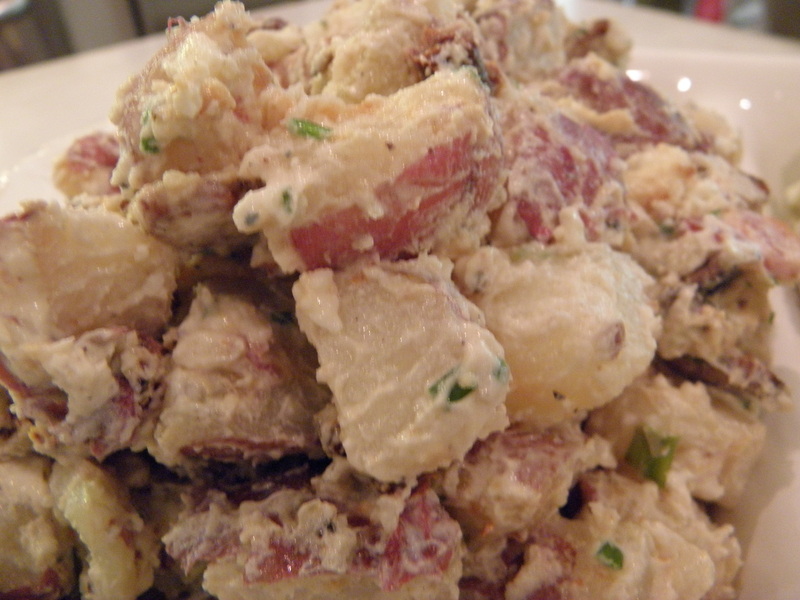 This dish is more a take on a Potatoes Savoyard which uses chicken broth and no cream. 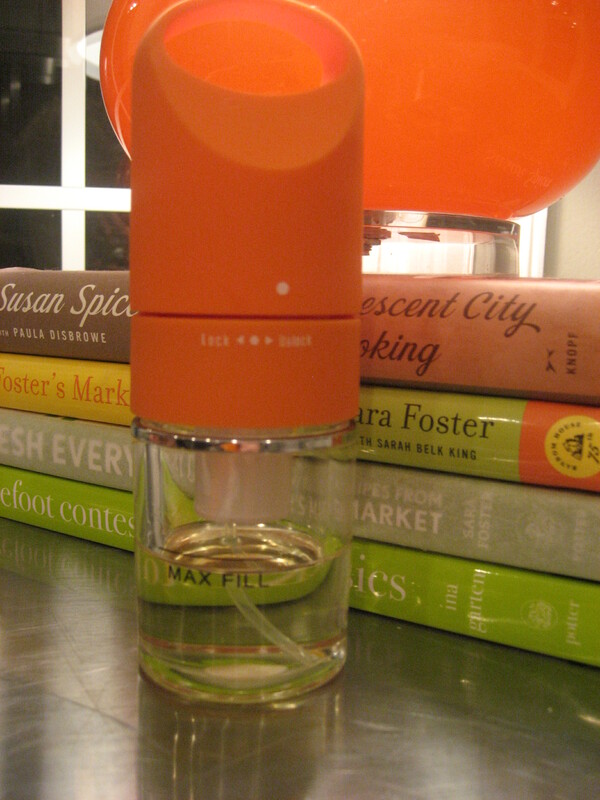 Oil Mister – just add you own oil, give a few pumps and say goodbye aerosol cans. Probably the best $20 I’ll ever spend on a kitchen gadget. 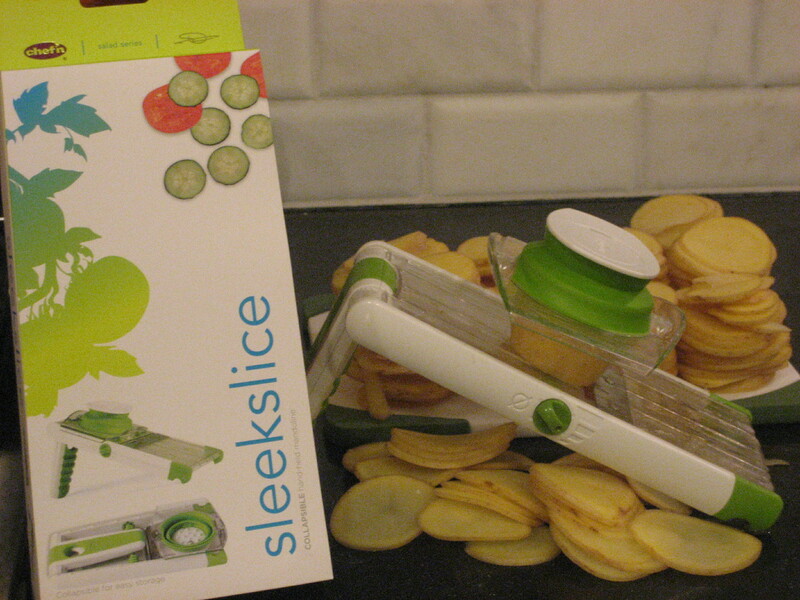 I had a mandoline but this sleekslice mandoline is compact, folds up and has a finger guard! This entry was posted in Side Dishes and tagged baking, birthdays, chicken broth, cooking, fat free evaporated milk, garlic, Le Creuset, oil mister, parmesan reggiano, potato gratin, potato savoyard, potatoes, recipe, sleekslice mandoline, Sur La Table on January 24, 2011 by lolleigh.